This beautiful flower stencil Chrysanthemum Twist is one of our Japanese Mon inspired stencil designs. Graceful floral and animal designs like these were used as family crests ( or mons) in ancient Japan. They could be found on furniture, textiles and various household objects. 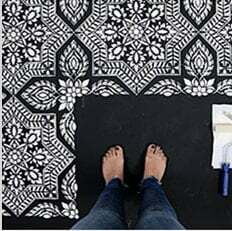 Now you can beautify your walls, floors, pillows and even t-shirts with these elegant stencil designs. Great for allover wallpaper look, or stenciled as a single ornament in a key space, or repeated as a vertical stripe. Perfect for DIY decor. Use just this design in one size, or add another one from the series and mix them up. Be creative and experiment, it's so much fun! This stencil is so easy to use, virtually anyone can do it. Simply tape it to the wall using BLUE painter's tape, (or secure it with spray adhesive), then load your dense foam roller with a paint of your choice (latex or acrylic). Offload the excess paint on a folded paper towel, make sure there is no excess paint. Then, just roll over the stencil applying light to medium pressure for an instant fabulous result! Don't press on the roller too hard otherwise you might get some bleed. Use a separate roller for each color. If you prefer shaded multi-color look, use stencil brushes ( one per each color) instead of a roller to create beautiful soft shading. We find that it is not necessary to use spray adhesive with our stencils, however if you want very crisp edges or are using high contrasting colors, please use it (Elmer's spray adhesive seems to be the best). The trick with stenciling is to take care not to over-load your roller or brush with paint and not to press too hard on a roller while stenciling. I personally prefer just to use blue painter's tape to secure the stencil, but for beginners I would recommend using spray adhesive just to make sure you get great results. When stenciling on fabric, stencil adhesive is very helpful. First, tape your fabric to the surface so it doesn't have any wrinkles or move around while you stencil. Use stencil brushes, or dense foam roller, and add some textile medium ( sold in craft stores) to your acrylics. You can also get a special fabric paint, but, frankly, good craft acrylics with a dollop of medium work just as well, IMO, and cost much less too! Use very little paint while stenciling. Let the finished stenciled image dry completely, 24 hours is best, then heat-set it by ironing the fabric for about 20 sec. ( more or less) on a low setting through the piece of cloth. Heat-setting will cure the paint and will prevent it from being washed off in the washing machine. Always experiment with a sample of your fabric first to ensure good results. I've stenciled on silk, cotton, linen and even sheer fabrics with great results. It's always better if your fabric doesn't have too much texture. The stencil is made out of durable 12 mil clear plastic stencil material. This material is strong but flexible, reusable and easy to clean. We love it so much more than standard 5-8 mil Mylar! It's not brittle, user friendly and just so easy to work with, you'll love the way it "hugs" the wall surface! In our many years of professional stenciling this material has proven to be far superior than any other stencil material we used. Our customers love it too, and we are sure that you'll notice the difference. Our stencils will last a long time and are a pleasure to use.